We are the only manufacturer with over 200+ installations of 500 units or more. Check out our map of installations across the country. Take a look at some of our projects and news coverage across the country. The topic of lumen depreciation is somewhat complex and the experts are not completely in agreement on issues like defining the point when a LED light source should be considered “failed”. With old technology lighting, determining the point that a lamp failed was an easy call. We turned the light bulb on and it went dark, no longer providing any light. That was the time when the light would be deemed to have failed. It is not that simple with LEDs, but here are some pointers from a layman’s point of view that hopefully will help facility managers, owners and operators have a better understanding of this topic. “Lumen depreciation” refers to the loss of the original light output of the lamp or fixture that occurs over time. If you wanted to say the glass is half full rather than half empty, you would phrase the issue using the term “lumen maintenance” referring to the light output remaining from the light source rather than the output lost. All lighting sources experience a loss or decline in the light they give off as time passes, including LEDs. In the case of your old metal halide, fluorescent or incandescent lamps, the loss of original light output occurs much faster than compared to LED lighting. But since this loss occurs steadily but gradually over that shorter time line, it often goes unnoticed until the light source “burns out”, and we then recognize it is time to replace it. The simple chart below from Google demonstrates the general hours of operation and the loss of light output from various light sources over time. A fair example might be a typical warehouse that gets re-lamped with fluorescent or metal halide lamps. The light level is okay for the warehouse operations after install as the light is providing adequate illumination for the tasks performed. 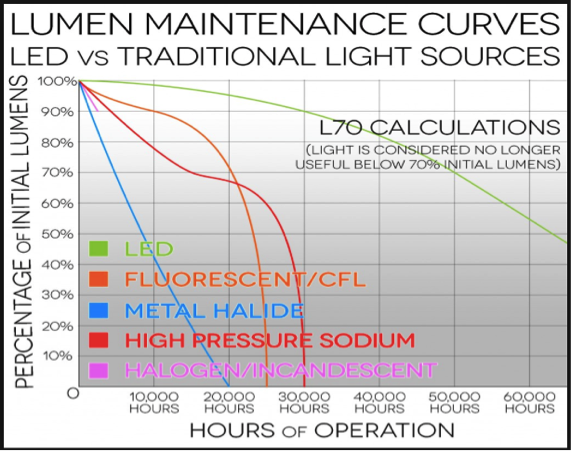 But as demonstrated by the graph above, in less than 20,000 hours of operation the metal halide lamp has reached a lumen depreciation or loss of light output of 30% of the original light level. If any tasks other than simple storage are being conducted at this point, such as bar code scanning, picking and packing, or fork lift operations, the remaining light output may be inadequate for efficient and safe operations. It would be an exaggeration to say there is uniformity among lighting experts as to the point when a light source should be deemed failed, but it is relatively safe to say that many opine that when the light system reaches the point where it is at 70% of the original light output, the lighting has reached the point where it is considered “failed” in the sense it no longer provides the required lumen output, or the minimum light level which the designers specified for the system lighting. Even if the light source continues to emit some level of light, that light is no longer adequate for the operations which use that lighting to perform tasks. The finer the tasks the greater the need to be aware of lumen depreciation. In the chart above you will note a reference to L70 calculations. When you are considering making a purchase of an LED lamp or fixture you should be aware of the findings in the L70 report for those products. L70 refers to a test and report, usually by an independent qualified laboratory, that predicts the time it should take for the LED lamp or fixture to dim to the point where the light output is 70% of its original output. For example, an L70 report that rates the LED high bay lamp or fixture at 50,000 hours is predicting that the LED product will maintain 70% of its original light output for at least 50,000 hours. The L70 rating is different than the expected life span of the LED lamp or fixture. The rated life of a LED lamp or fixture is determined by a TM21 test and report which uses the L70 and then makes a statistically determined estimate of the average operational life of the LED light source which is generally much longer than the L70 time. The typical older technology metal halide and fluorescent high bay lighting systems experience accelerated and significant lumen depreciation when compared to LED. As an example, a metal halide high bay lamp will lose approximately 10% of its original light output within the first 2,000 hours of operation compared to a quality LED high bay lamp or fixture that might experience a 10% lumen depreciation at around 30,000 hours. 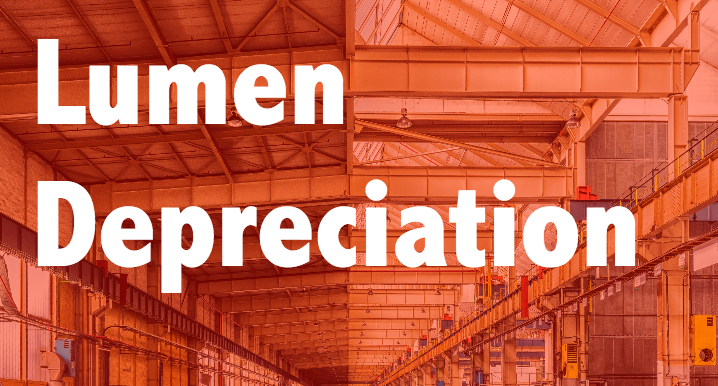 As you consider retrofitting or new lighting systems, lumen depreciation should be a significant factor in your lighting choice. Light output affects productivity, efficiency and safety. For those of you who want to delve further into this topic, there is a really good technical presentation you may want to review from the U.S Energy Department: Designing for the Future: Understanding Lumen Depreciation and Light Loss Factors. (Michael P. Roger, Ph. D., June 5, 2014). Start the conversation with Foreverlamp and learn how we serve you. Distribute market leading commercial & industrial LED lighting solutions. We are the only manufacturer with over 250+ installations of 500 units or more.